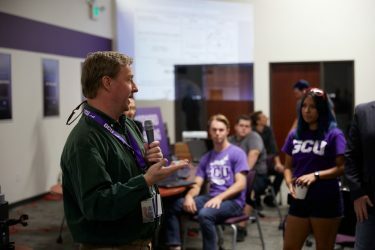 GCU is making cybersecurity education a major focus. When the World Wide Web took its first digital breath, it was more than a game-changing phenomenon. It was a virtual technology tsunami, and everyone wanted to play in the sand. Yet the world dallied in the sand with nary a care. “With computers, everybody was using them, but they didn’t see any implications as far as securing their information. All of a sudden, we get these bad actors out there, and they’re starting to take advantage of that, just like any criminal organization,” said Al Kelly, College of Science,Engineering and Technology lead cybersecurity faculty. Now, “the world is playing catch-up,” Kelly said of cybersecurity. Not that GCU merely wants to catch up. It wants to be the top dog in the fight when it comes to securing the cyber landscape and developing the industry’s badly understaffed workforce. “This (cybersecurity) is going to be a HUGE focus for us now – a major focus,” President Brian Mueller said at the all-employee meeting in January. Brett Scott, co-founder of the Arizona Cyber Warfare Range in the East Valley, introduces visitors to the Arizona Cyber Warfare Range-Metro Phoenix during a press conference in November on the GCU campus. The University has taken major strides in preparing that talent. In 2014, GCU began offering its bachelor of science degree in Information Technology with an Emphasis in Cybersecurity. GCU also formed a partnership in 2016 with the Arizona Cyber Threat Response Alliance, and in August 2017, CSET added an online master’s degree program in cybersecurity for those on a technology track. The latter is one of two cybersecurity-focused master’s degree offerings. The other, an MBA with an Emphasis in Cybersecurity, is scheduled to be launched in May by the Colangelo College of Business for those Cyber Lopes on a management track. Those degree offerings mark a change from when hackers – good and bad – honed their skills from the comfort of their basements. Also unique is the University’s methodology, Hackers With Halos. Beyond degree offerings, the University in 2017 became the home of the Arizona Cyber Warfare Range-Metro Phoenix, a free, hands-on, realtime, real-world cybersecurity training center. 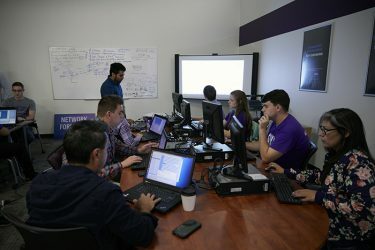 The volunteer-run facility, at the GCU Innovation Center in Building 66, near Camelback Road and 27th Avenue, is where anyone – not just GCU students – can drop by to practice such skills as password cracking, keycard cloning or system hacking, all with the goal of beating the bad guys. Besides professors building the range into their courses, “it’s a great opportunity for them (students) to network and meet people in the industry,” many of whom practice their skills at the range, Monthie said. In its 2017 Cybercrime Report, Cybersecurity Ventures said the cost of cybercrimes worldwide is expected to hit $6 trillion annually by 2021 and that cyberattacks are the fastest growing crime in the United States. Those cyberattacks take place every 39 seconds, according to a Feb. 10, 2017, article in Cybersecurity Magazine. Every day, it seems, major corporations report data breaches, from Equifax to Yahoo, and small businesses aren’t immune. According to a January 2017 Small Business Trends article, 43 percent of cyberattacks target small businesses and 60 percent go out of business within six months of the attack. With such statistics looming, the need seems enormous for cybersecurity professionals. According to Cyberseek, nearly 300,000 jobs need to be filled in the United States alone. Globally, 2 million unfilled cybersecurity jobs are expected by 2019, according to a March 2017 article in Forbes. Arizona Cyber Warfare Range-Metro Phoenix volunteer David Hernandez (standing) leads a network forensics activity at the range, which opened in the fall in Building 66 at Camelback Road and 27th Avenue. “There’s a huge need nationally for preparing cybersecurity professionals,” Monthie said. “Companies are struggling. It’s a war we’re not winning, and it’s a loss of money, a loss of private information. The consequences extend beyond just damage to businesses. 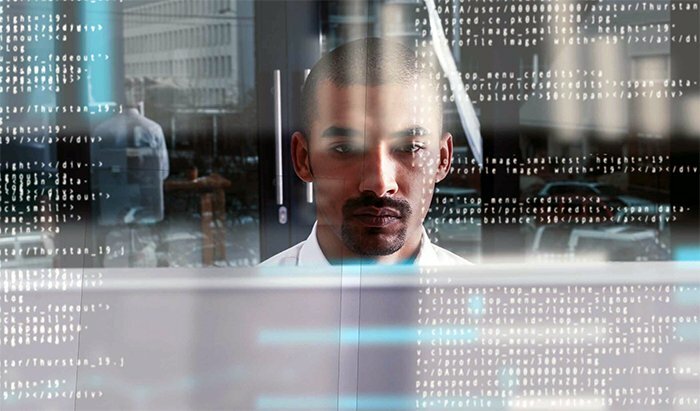 A well-trained cybersecurity workforce just might change that dreary outlook. With a cybersecurity degree in hand, a Cyber Lope is looking at a paycheck that could be lucrative. The median pay for a cybersecurity analyst, according to the Bureau of Labor Statistics in 2016, is $92,600, and Forbes reported last March that senior cybersecurity personnel can earn as much as $400,000. However, Kelly said the range in pay and job titles is vast, from IT security specialist to information security analyst to computer forensic analyst to counterintelligence security analyst, to name a few. It’s something GCU is determined to do. GCU senior writer Lana Sweeten-Shults can be reached at lana.sweeten-shults@gcu.edu or at 602-639-7901. Follow her on Twitter @LanaSweetenShul.